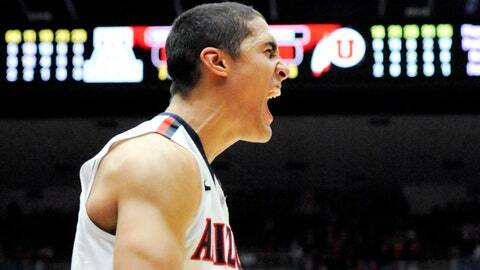 Is free-throw shooting Achilles heel for top-ranked Arizona? Top-ranked and unbeaten Arizona is shooting just 66.4 percent from the free-throw line this season, with freshman phenom Aaron Gordon the worst offender at 46.3 percent. TUCSON, Ariz. — Arizona coach Sean Miller finished his college playing career as an 88.5 percent free-throw shooter, good for 10th on the NCAA’s all-time list. But his team this year, while perfect in the win column, hasn’t been Miller-like at the line. Only guard Nick Johnson is even close, shooting 79.7 percent from the line, although center Kaleb Tarczewski at 77.2 percent and forward Brandon Ashley at 74 percent aren’t too far behind. 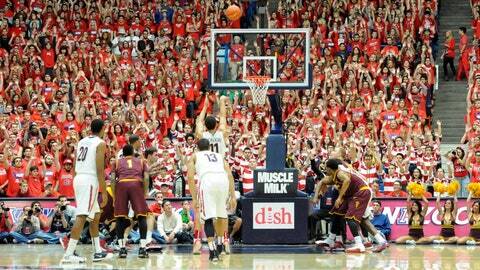 But as a team, Arizona is hitting just 66.4 percent of its shots from the line. It’s been the elephant in the room most of the season, even as the Wildcats have remained unbeaten at 20-0 and No. 1 in the country. Fortunately for them, late-game free throws haven’t decided many close contests, with the exception of Johnson coming through with some clutch shots from the line in the final moments of wins over San Diego State, Duke and Michigan. Miller sees the struggles as perhaps part of a trade-off. "We’re a work in progress," Miller said. "Sometimes the gift of your team is kind of a curse in another area. A lot of the things where your team does well — offensive rebounding and (being a) physical, defensive team — maybe that works against us a little bit when our team or those players go to the foul line." But Miller also said the team is working to get better and has already shown signs of improvement, pointing to some strong games on the road (all the aforementioned games were away from home) and adding that free-throw shooting in practice has gone well. The worst numbers, perhaps surprisingly, have come from freshman phenom Aaron Gordon, who is shooting just 46.3 percent (44 for 95) from the line. Every time he hits one, the crowd — which is well aware of his struggles — roars. "Aaron is working hard at it," Miller said. "Sometimes you feel like you’re turning the corner and sometimes not. I think it’s really mental with him." When asked about his own experiences with slumps from the free-throw line, Miller said it’s important not to think too much about it nor too little. "Some of it is mechanics and some of it can be overkill," Miller said. "We’re not talking about it too much and not ignoring it. We’re trying to have balance." Just last week, on a day off for the team, each of the players came in on their own and shot 100. Point guard T.J. McConnell, who is struggling at the line in his own right at 64 percent, said 100 shots a day is the norm as the players are "just trying to get better." McConnell added that the Wildcats are aware "that can win or lose someone a game if it comes down from free throws." And while McConnell acknowledged that it might be a mental issue, he said that can be solved by each player knowing that he can hit his shots when called upon. "We have some guys who are really confident from the line right now," Miller said. "And maybe (some) we have who aren’t." Miller has used the deeper part of his bench sparingly for most of this season, choosing to go with seven or sometimes eight players in his regular rotation (it’s been mostly seven lately). In all, the bench has played 6 percent of Arizona’s total 4,000 minutes this season. Senior Jordin Mayes has played the most of those players, tallying 96 minutes thus far. And the longer the season goes along, the more it looks like that’s how it’ll be the rest of the way. But Miller did praise those on the cusp of the rotation, singling out guard Elliott Pitts, whom he said is practicing "hard and well" and has a "bright future." Miller pointed out that he knows how problematic an injury or foul trouble can be, with "readiness" his biggest concern. Mayes and Matt Korcheck typically first in line if he goes to the bench. "Don’t be surprised if they are not going to be thrust into a role or moment here over the next couple of weeks," Miller said. "It’s important that we are working with them and talking to them."